The periodic precipitation process known as Liesegang ring formation has been investigated during the past 120 years and is one of the most recognized spatial and temporal heterogeneous structures in physical chemistry. If a soluble electrolyte is placed in contact with a second electrolyte in a gelatinous mass and, on interdiffusion, both react to form a poorly soluble salt, rhythmically arranged, separate precipitation develops parallel to the diffusion front. The beauty of this precipitation aside, research into Liesegang rings was mainly stimulated by the obvious parallels to processes in technology, geological structures and patterns in plant and animal life. Structural researchers increasingly consider the Liesegang experiments and their multifaceted manifestations as a basic phenomenon and a model case for a number of structuring processes in inorganic, organic and living nature. A continuous, end-to-end theory that takes the large number of interacting individual factors into account, thus enabling a full description of the complex reaction-diffusion mechanism, is still lacking. This is why attempts to extend the described phenomena of precipitate reactions in gelatinous masses to other structure formation processes are still tentative. This article provides an introduction. I am thankful for fruitful discussions on Liesegang systems with Prof. Dr.-Ing. K.-H. Jacob. Ph.D. and my then colleagues Dr. H.-J. Krug and H. Brandtstädter. Figures from references are reproduced with the kind permission of the respective owners of the publishing rights. I would like to thank D. McCartney for her translation and revision of this text. 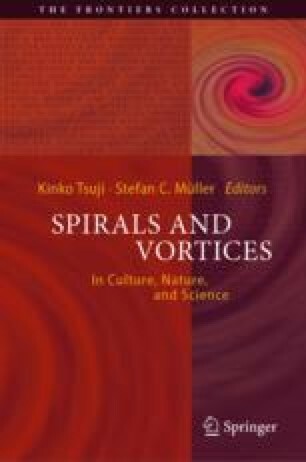 I would also like to express my gratitude to Dr. K. Tsuji and Prof. Dr. S.C. Müller for their inspiring initiative to publish this book as well for the fruitful discusstions on spiraling Liesegang systems.